The design of the 2019 Jaguar F-PACE reflects the manufacturer’s long history of performance vehicles. The aggressive stance and sporty, aerodynamic styling set it apart from the conservative design seen in many competing SUVs. However, it’s the Jaguar F-PACE’s features that really separate it from the other luxury SUVs in its class. The new Jaguar F-PACE has standard 18-inch wheels that give the vehicle its muscular stance. The 2019 Jaguar F-PACE also includes a power tailgate that’ll open at the touch of a button, making the process of loading items into the back of the vehicle much more convenient. The new Jaguar F-PACE even includes a standard panoramic roof that lets in that Florida sunshine without compromising the privacy of the occupants. At our Jaguar dealer, Ocala-area drivers can find multiple 2019 Jaguar F-PACE models to choose from. 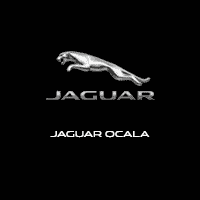 Take a test drive today at our Jaguar dealer Ocala! The 2019 Jaguar F-PACE embodies pure automotive class in a way that competing vehicles can only imitate. Jaguar has decades of experience manufacturing genuine luxury vehicles, and this shows in the prestigious ambiance created by the 2019 Jaguar F-PACE’s interior. Instead of simply covering everything with leather, Jaguar came up with an attractive design that makes the interior of the 2019 Jaguar F-PACE a pleasant place to spend time. The various interior features enhance and elevate the driving experience to unmatched levels. Not only is the Jaguar F-PACE luxurious, but it’s also practical. The standard split-folding rear seats allow the cargo space inside the vehicle to be maximized in just a few seconds. Jaguar’s commitment to detail is evident throughout the cabin, with details like the standard illuminated metal tread plates with beautiful Jaguar inscriptions. The standard suedecloth headliner is another premium detail that elevated the 2019 F-PACE’s interior design. Experience the sheer class of the Jaguar F-PACE at our Jaguar Ocala car dealership today. Schedule a Test Drive through our website today. Safety may not be the first thing on the minds of prospective 2019 Jaguar F-PACE buyers, but rest assured that Jaguar didn’t overlook occupant protection. The 2019 Jaguar F-PACE is every bit as impressive in the area of safety as it is in luxury or performance. The advanced construction and effective airbag setup are important in the Jaguar F-PACE’s approach to occupant protection, but it’s the driver aids that elevate the level of safety to unmatched heights. Come to our Jaguar car dealership in Ocala today to learn more about the 2019 Jaguar F-PACE’s safety features. Jaguar is known for the performance of their vehicles, so the 2019 Jaguar F-PACE has high expectations for its driving dynamics. The 2019 Jaguar F-PACE exceeds expectations in this aspect of automotive excellence just as it does in numerous other areas. 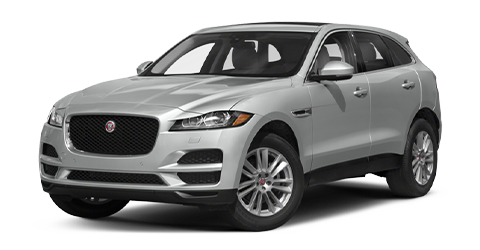 The racing heritage that Jaguar has is clearly evident in every powertrain of this sporty and luxurious SUV. The standard 2.0L turbocharged 4-cylinder engine kicks out a spirited 247 horsepower. The Jaguar F-PACE also has an optional supercharged 5.0L V8 that produces a massive 550 horsepower. Both of these engines are paired with Jaguar’s versatile 8-speed automatic transmission, which includes a manual mode for optimal driver control. The standard all-wheel-drive system provides excellent traction both on the road and off-road. 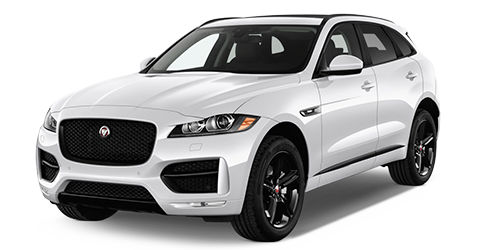 Take the Jaguar F-PACE out for a spin at our Ocala Car Dealership today. The lineup of technology in the 2019 Jaguar F-PACE is comprised of premium, cutting-edge features that competing luxury SUVs simply can’t match. Many of the most desirable tech features in the 2019 Jaguar F-PACE are standard. This compares well with the approach competitors take to technology, in which the best technology is often only available as an expensive option. The standard Meridian™ Sound System in the Jaguar F-PACE has 380 watts of power for a bold listening experience. The standard 10-inch touchscreen makes it easy to select entertainment options and vehicle settings. The Jaguar F-PACE even has standard HD Radio™, so occupants can listen to their favorite stations in high-resolution. Check out the cutting-edge technology in the Jaguar F-PACE by taking a test drive at our Jaguar dealer, Ocala’s preferred destination for English luxury vehicles.